Lost? Never fear! The Galaxy Tab knows where you are. Not only does it have a GPS, but by using the Maps app, you can also instantly find out where you are and what’s nearby and even send your location to someone else. 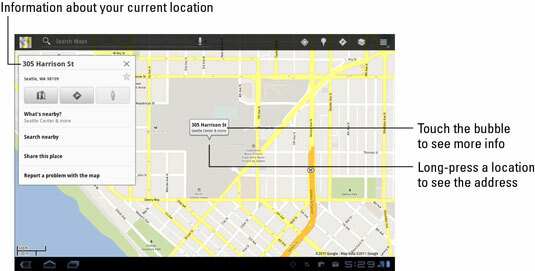 To find your current street address, or any street address, long-press a location on the Maps screen. Up pops a bubble that gives your approximate address. If you touch the address bubble, you see a pop-up window full of interesting things you can do. When you’re searching for a location, distance and general direction are shown in the pop-up window. Otherwise, the distance and direction information isn’t necessary. The What’s Nearby command displays a list of nearby businesses or points of interest, some of them shown on the screen and others available if you touch the What’s Nearby command. Choose the Search Nearby item to use the Search command to locate businesses, people, or points of interest near the given location. What’s really fun to play with is the Street View command. Choosing this option displays the location from a 360-degree perspective. In Street view, you can browse a locale, pan and tilt, or zoom in on details to familiarize yourself with an area, for example — whether you’re familiarizing yourself with a location or planning a burglary.